So it’s only a week away! The CD release show that we’ve been waiting for for months is finally going to happen. I can’t begin to tell you how excited I am about it! At this point in time i am exhausted trying to advertise for this show. It takes so much to put it all together and get the word out. I’ve driven to every single newspaper in town, I’ve spent, hours putting ups flyers, I’ve done radio and television shows so that we can advertise to new people, I’ve been maintaining about 15 sites of ours, and so much more! It’s so crazy how much it takes to get it all done. But, we’ve gotten some great response from people, bands, the media, and past and newly found fans. So THANK YOU, THANK YOU, THANK YOU! the support means so much to us in setting this whole thing up. If I didn’t have the support of wonderful people like you, we still be unknown and no one would care about us. The big thing that I wanted to talk to you about was, of course, the CD release show. It really will be the biggest all local event of the year! We have the most amazing bands playing, and supporting us! Thank you to Drop Dead Julio, The Futurists, This New Empire, and Zack Vandermyde! These bands are phenomenal, and have spent a lot of time advertising and helping the cause for this show! And thanks to the Murray Theater for allowing us such a big, great venue to be able to make this happen. If you haven’t noticed yet, our album is already available online at iTunes, CD Baby, Amazon, and Napster, to name a few. We’ll be selling the album at the show too. And whoever buys an album gets a T-Shirt for half the cost, and a FREE sticker while supplies last!!! $15 and you get a whole pack of stuff! Pretty sweet huh? We’d all love to see your face there! Our debut album This Stage is available through iTunes, Amazon, Napster, CD Baby, and anywhere else fine music is sold! 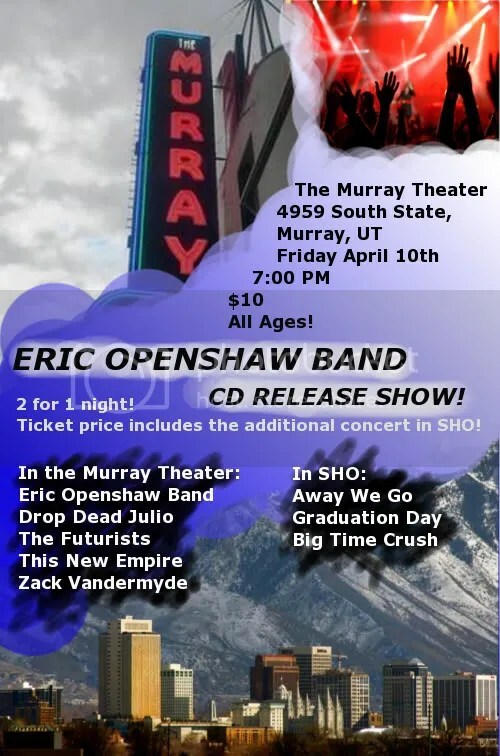 Our CD release show on Friday, April 10th @ the Murray Theater in Murray, UT! BUY TICKETS FOR OUR CD RELEASE SHOW DIRECTLY FROM US!!!! Also, I wanted to let you know that our bands awesome bass player will be playing a CD release show too on April 18th @ Sugarhouse Coffee. He’s got some great tunes, check it out! check him out @ MYSPACE.COM/ROBALVORD. Once again, thanks for all your wondeful support and love! it means so much to me and my band.